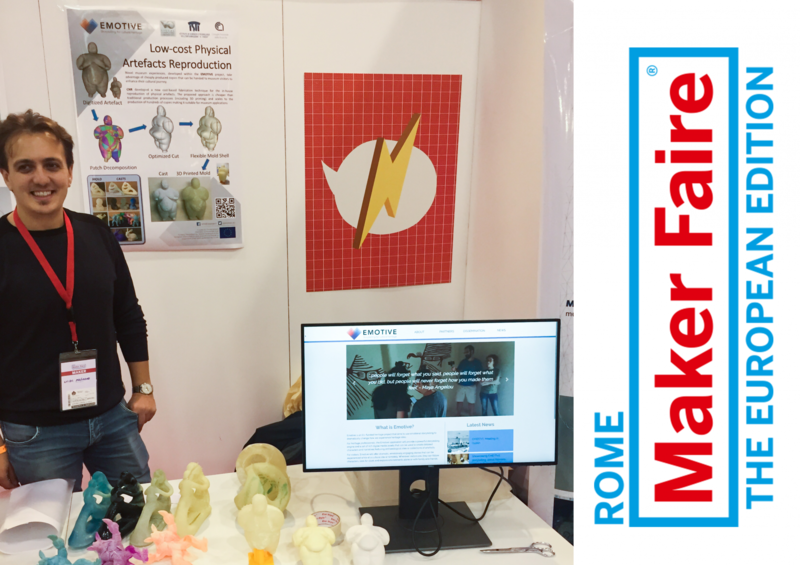 Members of the EMOTIVE team rounded off 2017 with a very successful appearance at MAKER FAIRE ROME – The European Edition 5.0, in December. Our project was represented by the Visual Computing Lab of the ISTI – CNR, who showcased their contribution to EMOTIVE: flexible molds technology for fast and cheap reproduction of cultural heritage artifacts by means of casting. CNR’s use of the classic casting approach allows it to overcome the limitations of current fabrication techniques, like FDM 3D printing, which requires hours to create a single reproduction. Instead, with CNR’s approach, a non-skilled user can prepare a cast reproduction on demand in less than an hour. Maker Faire originated in 2006 in the San Francisco Bay Area as a project of the editors of Make: magazine and has since grown into a significant worldwide network of both flagship and independently-produced events. Today, it’s a forum for professionals to show what they‘re making and share what they’re learning. December’s Maker Faire in Rome was attended by over 100,000 visitors, all keen to check out the latest tech inventions and innovations. We’re delighted to see such interest and enthusiasm for EMOTIVE’s work at the event!